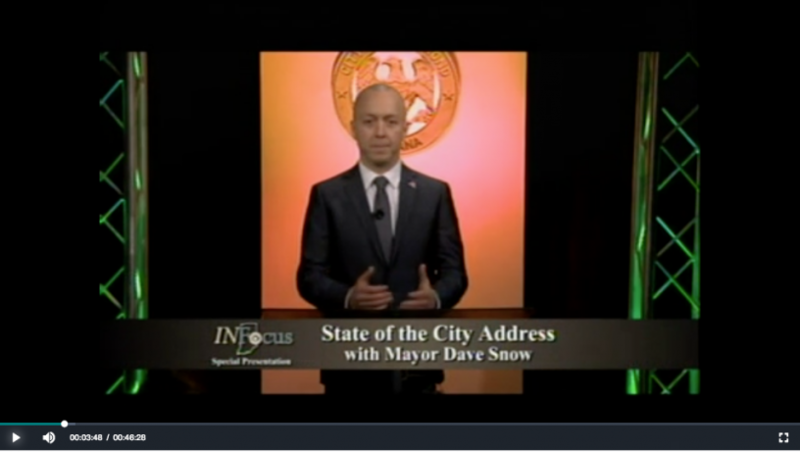 I had the honor of being in the studio audience tonight as Mayor Dave Snow gave his State of the City address. The speech was broadcast live and you can also watch the full video replay from Whitewater Community Television on WGTV. First, it was unexpectedly refreshing to hear a political office holder speak with such clarity, maturity and specificity about the successes and challenges facing a community. Maybe I’ve been listening to too many state and national politicians talk lately, but I continue to appreciate Mayor Snow’s style of communication as one that celebrates the good, acknowledges the things that are hard, and encourages action from everyone involved, all without the fluff or hyperbole that has become too common in political speech. Second, Mayor Snow’s priorities for the Richmond community seem very grounded and in tune with the other conversations I hear happening around town. He said tonight that a focus on business growth/retention, infrastructure development, and building up our population will contribute significantly to the future success of Richmond. Those are concepts up for broad interpretation and I suppose there’s a danger that they could be too broad to be useful. But, I believe that the Mayor’s actions in office so far have shown a keen appreciation for details and the need to figure out what to prioritize and what to put aside for the time being. Citing that 80% of new jobs in Richmond come from existing businesses, that removing the old hospital building on Chester Boulevard is critical, and that renewed efforts to improve quality of life so that young people want to stay in the area and make a life here seem to point to a nuanced understanding of how we can make progress in these areas. It was heartening to hear the Mayor say he will pursue an amendment to the city’s human rights ordinance that adds protection from discrimination based on sexual orientation, age and veteran status, and to revive the Human Rights Commission, which was de-funded in 2009. I strongly agree with the Mayor that the need help to make Richmond a “welcoming, safe place to call home” in part by supporting efforts to investigate and resolve discrimination cases is so very important, perhaps now more than ever. All in all, I thought the Mayor’s speech was helpful, realistic, encouraging and forward-looking. As he has done all along, Mayor Snow issued an invitation to all of us to be a part of something great, and to bring what each of us can to the progress that will be made. I hope Richmond accepts this challenge. Thank you for your thoughts. I respect your opinion and appreciate you keeping me informed about what’s going on in Richmond.